Born into a family of musicians led by two string players and music teachers, Amos Fayette started playing the violin at age two and hasn’t stopped since. He made his professional debut at the age of eight and has since enjoyed a diverse career as a performer, educator, and administrator. He currently holds a bachelor’s degree from the Peabody Conservatory of the John Hopkins University and a master’s degree from the famed Juilliard School of Music. This was supplemented with time as New World Symphony fellow under Michael Tilson Thomas and as a student of Glenn Dicterow at The Manhattan School of Music. Amos Fayette’s orchestral career spans four continents and includes appearances with many of the world’s leading conductors. He has performed as concertmaster with Michael Tilson Thomas, Alasdair Neale, Michael Frances and Timothy Hankewich in venues ranging from The Tanglewood Music Center to Orchestra Iowa. Recent appointments include time with the Mid-Atlantic Symphony and Washington Heights Chamber Orchestra as both concertmaster and soloist. The 2017-2018 performance season included appearances with the Mid-Atlantic Symphony, at La Chaillol and Le Vigan in France, recital presentations at the Dover Public Library, Biggs Museum of Art, and the Music School of Delaware’s “Music Masters” series; as well as several solo recitals for select groups. Past seasons include appearances at the famed Barge Music to The Juilliard School, New World Symphony, Orquestra Filarmonica de Medellin, and Washington Heights Chamber Orchestra among others. 2018-2019 performances include scheduled appearances with the Mid-Atlantic Symphony, the Delaware Symphony, The Music School of Delaware, the Dover Strings Festival, and the Washington Heights Chamber Orchestra, where he is set to premiere a new violin concerto by music director Chris Whittaker. More dates are being added all the time, please continue to check back here often or check out Amos’ Facebook page for information. 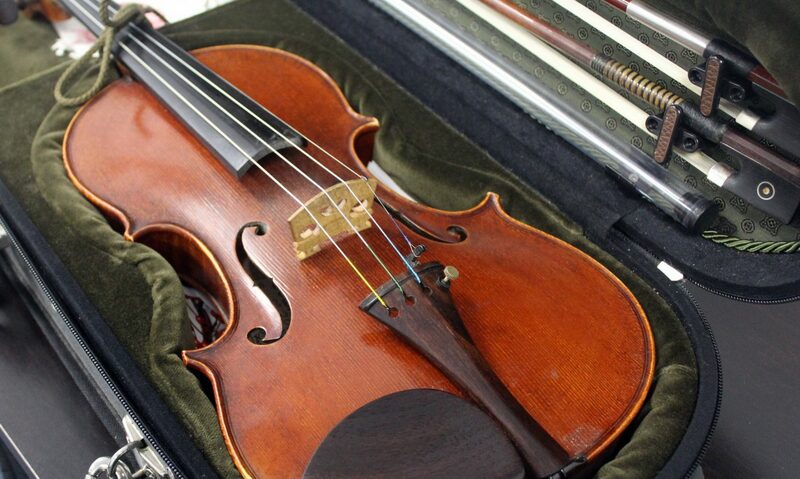 His violin was custom crafted for him by American luthier Edward Maday. Amos currently works as the Milford Branch Director for The Music School of Delaware, the only statewide and nationally accredited community music school in the United States. In addition to leading the team in Milford and several satellite locations, he also teaches students himself from beginners to more advanced players and is available for lessons, professional consultations, career advice, and master classes. He also continues to perform, both as a soloist and part of ensembles, duos, and orchestras serving as guest concertmaster and substitutes for several orchestras and groups. For information on how to book Amos for a performance, class or lesson click the contact link above and fill out the form and we will be in touch.